Establishment of a Sustainable Platform'. 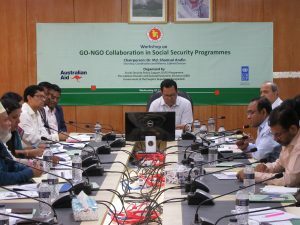 Participants of the meeting included officials from Cabinet Division, Local Government Division, Finance Division, Ministry of Food, Ministry of Disaster Management and Relief, Ministry of Social Welfare, Ministry of Women and Children Affairs, representative from NGO Affairs Bureau. Participants also included representatives from the following NGOs and Civil Societies: Action Aid Bangladesh, ASA, BRAC, CARE Bangladesh, Gonoshasthaya Kendra (GSK), HelpAge International Bangladesh, Manusher Jonno Foundation (MJF), MRDI, HelpAge International Bangladesh, Palli Karma-Sahayak Foundation (PKSF), RDRS Bangladesh, Wave Foundation, World Vision Bangladesh. Mr. Md. Faizul Islam, National Project Director, SSPS; Mr. Aminul Arifeen, National Project Manager, SSPS and officials from SSPS Programme also attended the workshop. Copyright © 2019 Social Security Policy Support (SSPS) Programme. All rights reserved.